Sparkle and shine in these beautiful CZ Huggie Hoop Earrings with Ornate Design from Jewel Connection. These stunning earrings feature an easy to use hinge to secure to your ear. Delivered in a beautiful gift box, these earrings make the perfect gift for any occasion. 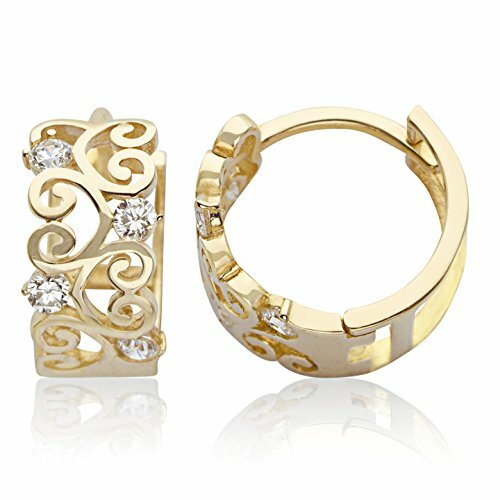 ★ GOLD FOR GOOD: Made from 14K yellow gold, these CZ Huggie Hoop Earrings with Ornate Design are perfectly suited for women and girls. This classic design will add elegance to any outfit. ★THERE IS NO WAIT: Delivered FAST, these CZ Huggie Hoop Earrings with Ornate Design get to you quickly so you can start wearing them when and where you want.